Nach dem Anlegen Ihres Kreuzfahrtschiffes im Hafen von St. Maarten unternehmen Sie eine 3-stündige Sightseeing-Tour durch die französische und niederländische Seite der Insel. Erkunden Sie mit einem lokalen Guide die niederländische Hauptstadt Philipsburg und überqueren Sie die Grenze, um den charmanten Marigot St Martin zu entdecken. Machen Sie Fotostopps an Aussichtspunkten und spazieren Sie durch die Ladenstraßen beider Städte. Erfahren Sie mehr über die Geschichte und Kultur dieser geteilten Insel, trinken Sie ein kostenfreies Getränk und nutzen Sie den Hin- und Rücktransport vom Kreuzfahrthafen aus. We were so fortunate to be the only ones for this tour and it was fantastic. We received a gracious welcome and learned so much about St. Maartin, both the Dutch and French sides. Touring the devastation from Hurricane Maria made a profound impact on the scenery as well as the infrastructure. We learned how the Dutch government had been instrumental in the rebuilding of their side of the island and the French have been less inclined to help their citizens regain a life. We were given several opportunities to walk around various areas including the famous beach. We highly recommend this tour versus a crowded ships's excursion! The sights were beautiful. 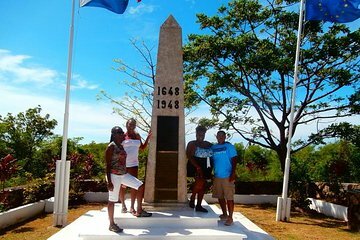 This was our 3rd time visiting the island. We saw several areas that we had never seen before. Unfortunately, our driver /guide was not very informative at all. He answered questions but didn't point out much. I pointed out a few points to the other passengers. Diderickson brought 14 of us on the tour to Marigot, stopping along the way for photo ops. We drove in comfort and learned much about the island, its history, and its customs from Diderickson, who is most knowledgeable and pleasant. We all consider it one of the best tours we've ever been on and we wouldn't hesitate to recommend this tour. Great tour with our guide, Douce, who showed us all the out-of-the-way interesting things to see on the trip from Phillipsburg to Marigot.